The great Japanese conductor Ken-Ichiro Kobayashi (b. 1940) is probably largely unknown to many British readers. Many Japanese conductors from Kobayashi’s generation, such as Hiroshi Wakasugi (1935-2009), Seiji Ozawa (b. 1935), Kazuyoshi Akiyama (b. 1941), Michiyoshi Inoue (b. 1946), Tadaaki Otaka (b. 1947), Kazuhiro Koizimi (b. 1949) and others, have transitioned to an international career when pre-war Japanese conductors largely – though by no means exclusively – focussed on conducting in Japan only. The Meiji Restoration of the 1850s had opened up Japan to many western influences, especially in classical music. Japan’s alignment with Nazi Germany in the late 1920s and 1930s, and its own imperial expansion into Indo-China, had closed off these cultural gateways. Just as Germany and Austria went through a period of post-war de-Nazification, so Japan too went through a gradual period of readopting more western values after 1945. In Kobayashi’s case, his cultural and classical influences are strongly central-European, and he has largely been based in Budapest and Prague; with Ozawa and Akiyama it has been the United States and Canada, with Wakasugi it was Dresden. Since 2013, Kobayashi has established a new recording relationship with the London Philharmonic Orchestra (a complete Tchaikovsky symphony cycle has already been released), and this Shostakovich disc comes from sessions laid down at Abbey Road studios in April 2017. Kobayashi, it should be said, is one of the most recorded Japanese conductors, and has been for decades. Compared with some, however, his repertoire remains quite small, even within the canon of composers he does conduct. He has never conducted Mahler’s Fourth or Sixth, he has never recorded any of the large-scale Richard Strauss tone poems, his Bruckner is limited to the last three symphonies and the Fourth, he rarely ventures into the twentieth century or conducts opera. At the other extreme, there are at least half a dozen recordings of Berlioz’s Symphonie Fantastique, multiple cycles of the Tchaikovsky, Brahms and Beethoven symphonies, and three recordings of Tchaikovsky’s Manfred Symphony. At his very best, Kobayashi is one of the most incandescent conductors, with a phenomenal ear for detail and an ability to illuminate a score with unrivalled insight. He can electrify an orchestra into playing of such precision and attack you are spellbound by an entire recording (his Czech Philharmonic Manfred Symphony, for example); on the other hand, he can completely suppress every ounce of drama and energy the experience becomes lifeless (his London Philharmonic Manfred springs to mind). These extremes are completely common with him. An Eroica, recorded with the Czech Philharmonic, channels Klemperer and Horst Stein in an age when conductors eschew that style of conducting; yet, Stravinsky’s Rite of Spring, which he has recorded a number of times, is raw, brutal and given with such power and venom you are left overwhelmed by the experience of hearing it. You yearn to hear him in a composer like Berg, yet he avoids Berg. Shostakovich’s Fifth is the composer’s only symphony Kobayashi has recorded, and this LPO recording is his second. The first, given with the Nagoya Philharmonic in 1999, at a live concert (as many of Kobayashi’s recordings are best heard) somewhat divides opinion. It is a highly expressive reading, owing a large debt to Bernstein’s New York Philharmonic recording, though I imagine this is unintended: Kobayashi has little in common with Bernstein’s highly romanticised approach to Shostakovich. He is also a long way from the approach taken by conductors like Ashkenazy (with the Philharmonia in Tokyo) and Mravinsky with the Leningrad Philharmonic in their 1973 recording from the Great Hall, who are up to ten minutes faster than Kobayashi. Kobayashi goes for weight and impact, not for drive and tempest. The playing is a tad rough, but it is an undeniably exciting performance, if perhaps rather anodyne in its phrasing. Almost twenty years later, and Kobayashi has at his command a much finer orchestra in the London Philharmonic, an orchestra certainly more idiomatically closer to Shostakovich’s innate blend of Russianness (this is after all, the orchestra which gave the world premiere of Shostakovich’s Leningrad in 1942 under Henry Wood, and the UK premieres of the Sixth and Tenth Symphonies), and the results are very different indeed. Kobayashi takes a slightly broader view of the first movement (just over a minute longer in the new recording) but the major difference is that the LPO gives a much more Slavic interpretation of this symphony than their Japanese colleagues did in 1999. Strings dig deep (very deep, indeed) and the brass are much more golden-toned than you find in Nagoya. One could argue that the very spaciousness of the conductor’s tempo for the Moderato – especially since Kobayashi tends to emphasise certain bars over others – distorts some of the rhythms; it is not that the music becomes static, rather a sense of friction acts as a bulkhead suppressing some of the symphony’s progressive momentum. There is no lack of charm or satire in the Allegretto; indeed, given the weight of the playing, the whole movement has tremendous buoyancy. The Largo is a thing of great beauty in this recording. The LPO strings have a luminosity to them, which Kobayashi controls with a tight rein on their dynamic range. The celesta and harp emerge with the slow-burning impact of a candlelight through mist. They are seamless parts of the texture of the whole canvas, not separate parts of it. At 15 minutes, Kobayashi takes his time over the Largo – and you feel it is worth the wait when the climaxes are so powerful, intense and anguished. The final movement plays to the LPO’s strengths – growling basses, crushing timpani, pungent woodwind, expressive brass. The path to the symphony’s close may be a slow burn but the dissonance and explosive impact are considerable. Indeed, the way Exton have recorded this studio performance (in DSD at 11.2MHz), and the impact they have tried to achieve, reminds me of a comment the producer Richard Mohr once made about Toscanini when the conductor complained about some engineering problems in a recording of Respighi’s Pines of Rome. “But, maestro, if we record it any louder we’ll break the equipment.” To which Toscanini replied: “Break the equipment!” There is no doubt the detail and depth of the recording is a thing of wonder, but there are some issues with instrument reverberation and echo at climaxes and over-amplification – and there is some very audible microphone interference at the close of the final movement. There are also problems with audio-stitching – in the first movement between 1:48 and 1:52. In the Largo, there is a significant microphone bounce at 1:15. 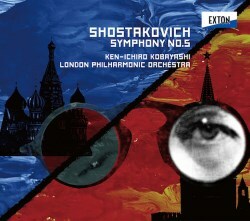 In part, I am certain that these problems are to do with Exton’s unfamiliarity with the London recording studio (this is, after all, an entirely different acoustic to a concert hall, which is Exton’s usual medium) – but they are also to do with simpler matters such as not protecting microphones adequately against the possibility of overdrive. These problems did not seem to affect the couple of Tchaikovsky/LPO discs I have heard – and I hope they will not affect Scheherazade and Pictures at an Exhibition recorded during the same April sessions. Technical problems aside, Kobayashi’s Shostakovich Fifth is a powerful, superbly played performance. Not a first choice, but a highly individual take on this symphony from a conductor who is never less than fascinating to hear.